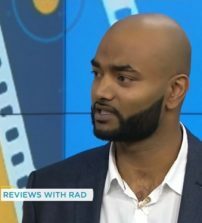 Rad is the Toronto-based film critic for Canadian national breakfast show Your Morning on CTV. He also contributes to CTV News Channel, CBC Radio and NOW Magazine. Rad has an M.A. in Cinema Studies from the University of Toronto, which is where he also instructed a tutorial on Film History.